Painting a splattered nail design can be time consuming. Switching between colors requires cleaning brushes and tediously applying multiple dots. This tutorial changes all of that because it uses multicolored sequins and gold glitter. 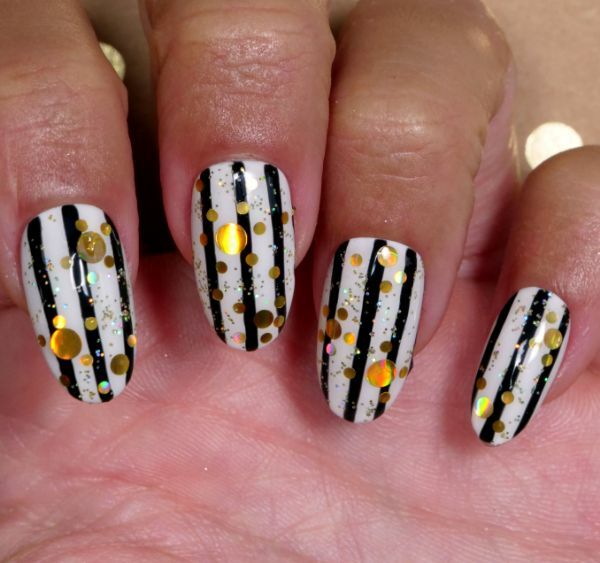 When set atop a black and white striped manicure, the end result is shiny and daring. As always, make sure your nails are groomed, clean and oil-free before applying the polish. 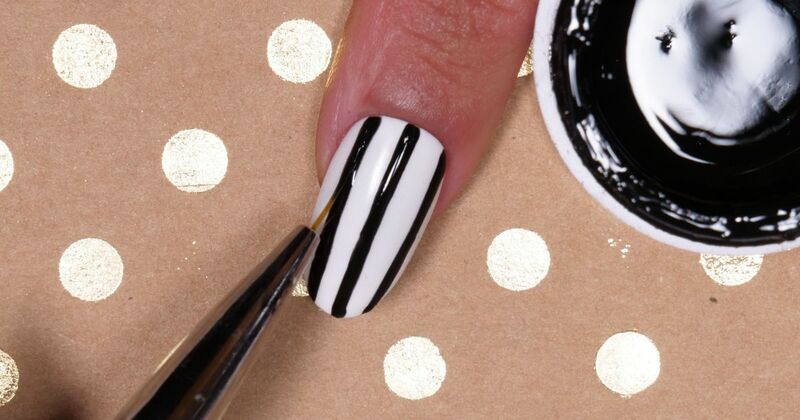 The tutorial features a white base nail, but you can reverse the black and white for a more dramatic look. Round sequins work best for this design, so use two different sizes for a dramatic look. 2. Paint three vertical black stripes on the nails with the fine detail brush. Then cure them with the lamp. 3. Apply a single coat of clear base gel to the nails, but do not cure it. 4. Press the dotting tool lightly against the wet gel. Then use the tool to pick up a sequin and place it on the nail. Repeat this step four or five times. 5. Use the dotting tool to apply gold glitter to the nails as well. Cure the wet gel paint with the lamp again. 6. Apply one layer of clear gel top coat to the nails. Then cure them with the lamp. Enjoy this bold and dramatic new look for your nails!